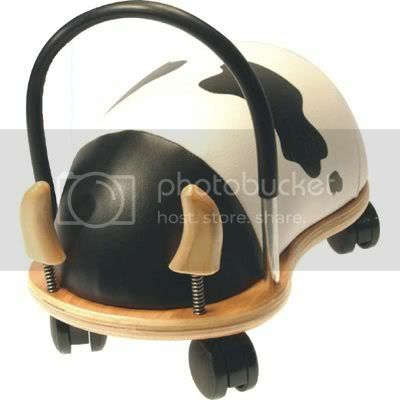 Wheelybugs go backwards, forwards, sideways, round and round ... they can be ridden, pushed, pulled, kissed and cuddled! These ride on bugs, great for both boys and girls,almost have a magical mind of their own. Children dont get stuck against obstacles like some other ride on toys. The distinctive shape of the Wheelybug is very user friendly. The bright designsare an instant attraction to girls and boys alike. Wheelybug bodies have a padded layer of sponge which is covered with a tough layer of polyurethane leatheroid and can be easily wiped clean. The base is made from plantation grown Poplar plywood and has safe ergonomic rounded contours. The "feelers" which wobble and delight are made with stainless steel spring and have an internal limiter cord to prevent pull out. Thehandle is aluminum so it won't rust... all in all Wheely Bugs are constructed for years of fun.